Or as I like to say, It’s *RAINING*! San Jose had the second driest December on record, dating back 124 years. I love the rain under any conditions, but today’s January storm feels downright celebratory after such a dry start to our winter. 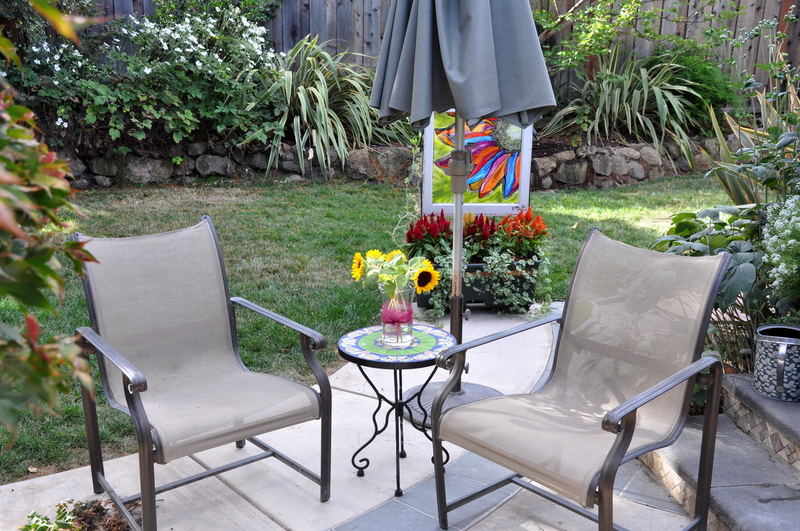 What better day to go out in the garden to clip some blooms while soaking up the negative ions that make us feel good. I’m joining Cathy and Cathy today for a regular feature they call In a Vase on Monday. Cathy, at Rambling in the Garden and Cathy at Words and Herbs faithfully post a vase of flowers from their garden year round. It’s not always easy, especially when you garden in Bavaria, but these two are an impressive pair. 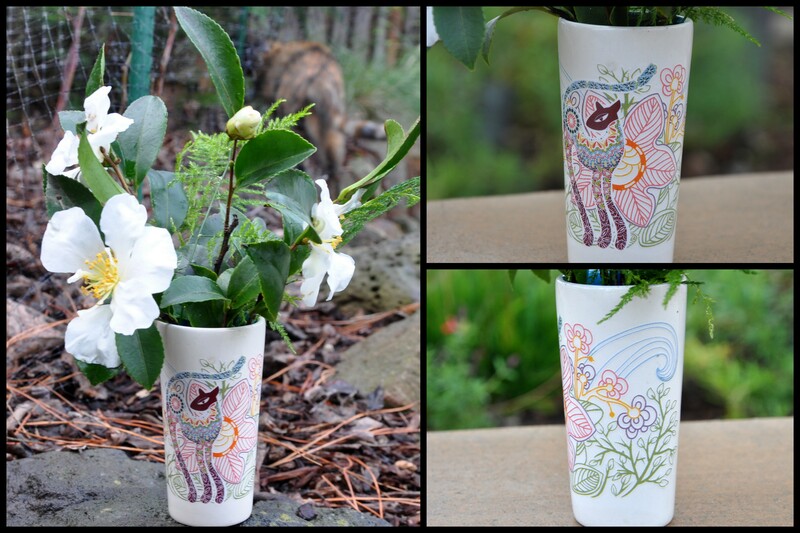 My vase features something old and something new, pretty fringe and a cat, too. A year ago I received a bottle of blush wine in this charming, cat-shaped bottle. It sat untouched for a year as I’m not really a fan of pink wine. Wine lovers, please look away now. 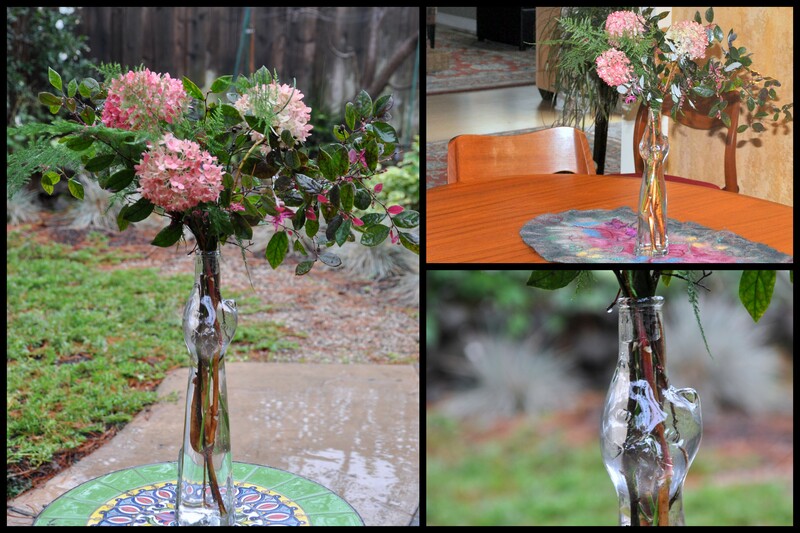 I poured the pink wine down the sink, rinsed the bottle, and voila, a pretty glass vase. Okay, you can look now. 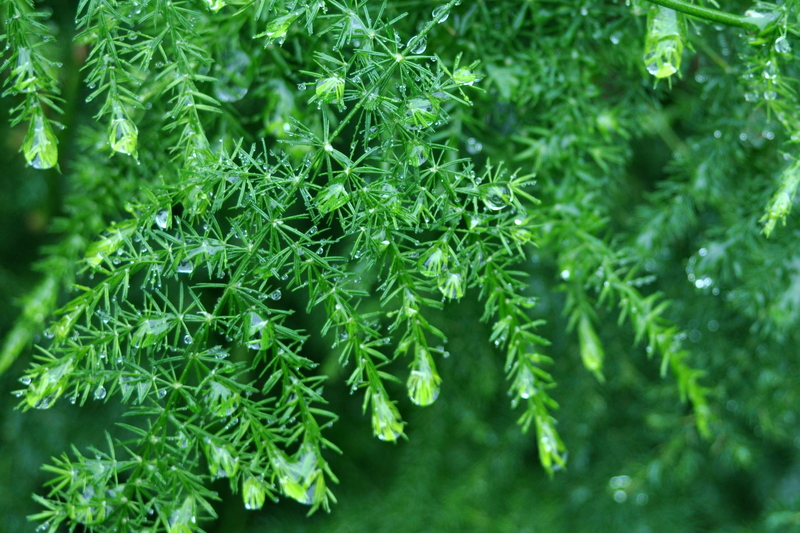 The something old comes from my cherished green asparagus fern. In 1988 I bought a pair of ferns for 79 cents and kept them on my nightstand in my one-bedroom apartment for two years. I moved and the plants moved with me. By the time we bought this house 21 years ago, my sprawling fern could no longer be contained. It’s now growing happily along the back fence. If that plant could talk, eh? 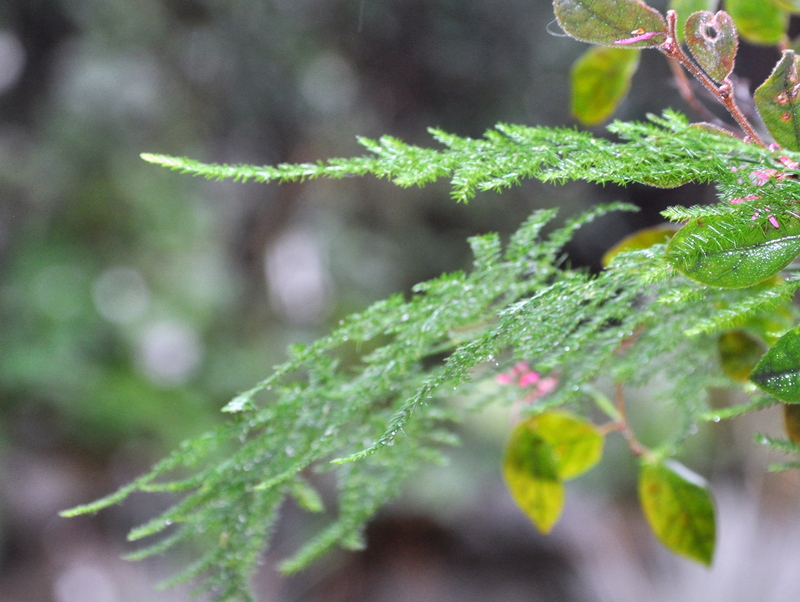 Something new is the fresh-fallen rain drops. Isn’t it amazing how everything looks lush after a decent rain? 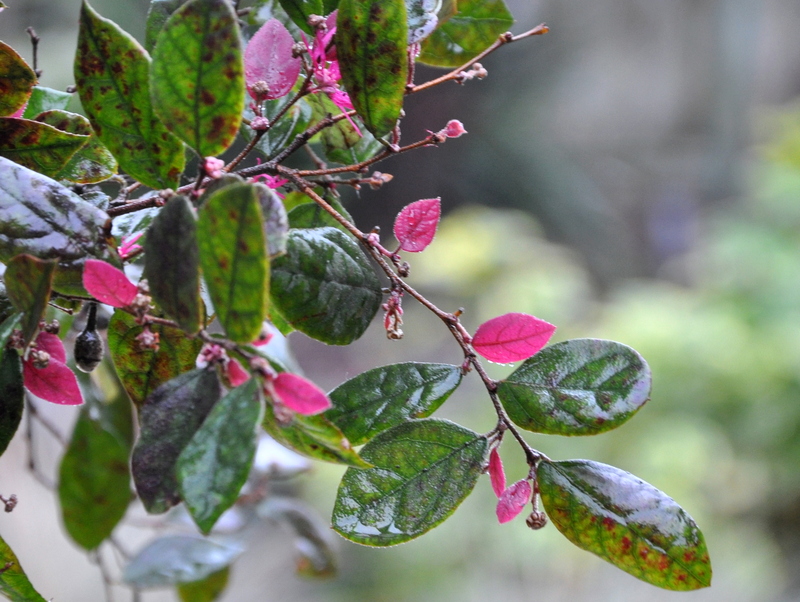 The pretty pink fringe you see comes from a few branches of my Loropetalum chinense or Chinese fringe plant. 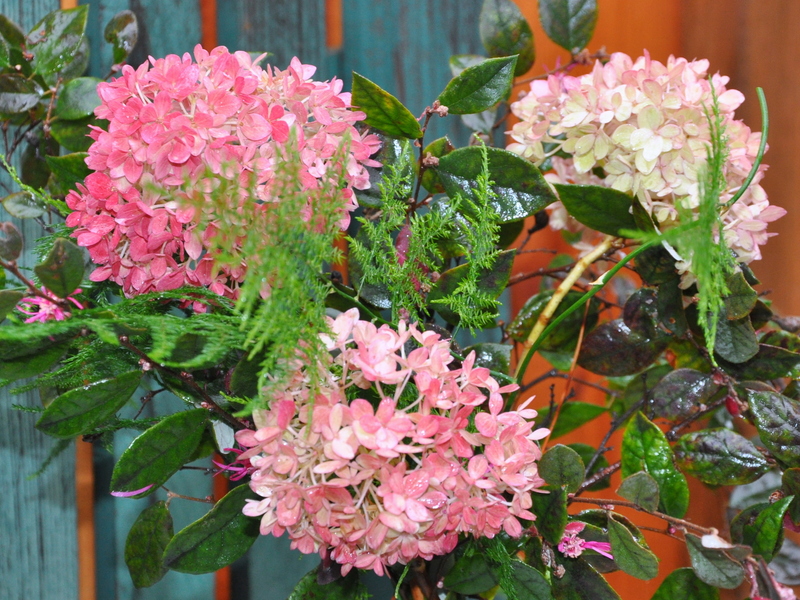 It’s a nice complement to last year’s hydrangea blooms, currently faded to shades of cranberry and pink. 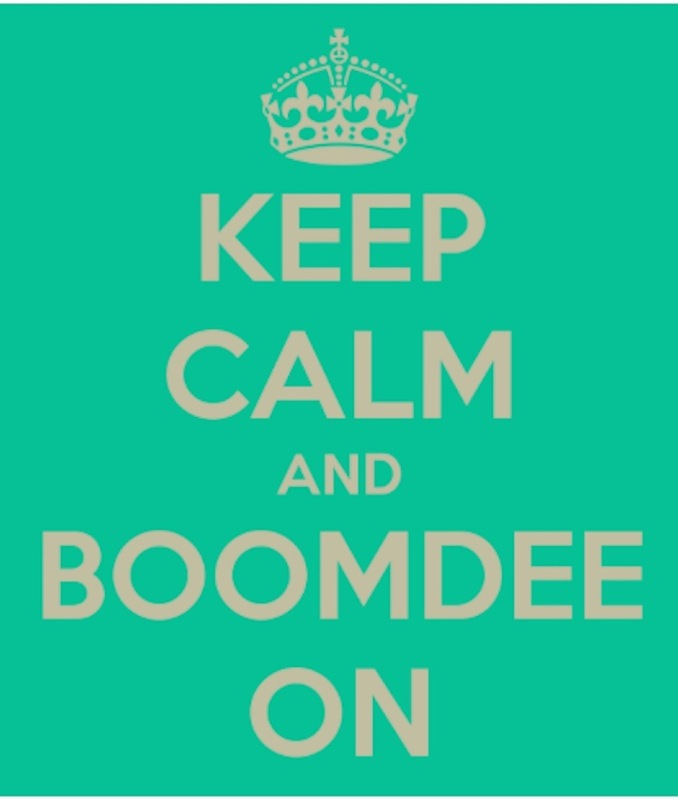 I hope you have a terrific week. If you need me, I’ll be outside enjoying the rain. 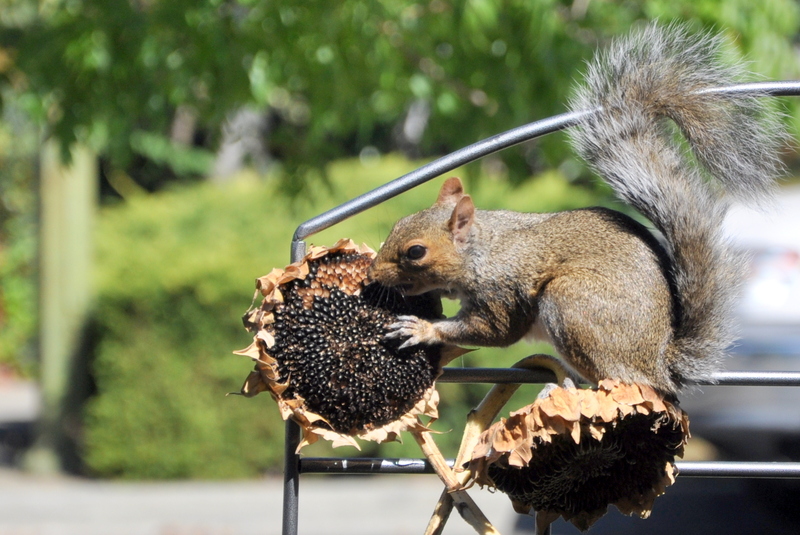 My sunflowers are going fast. 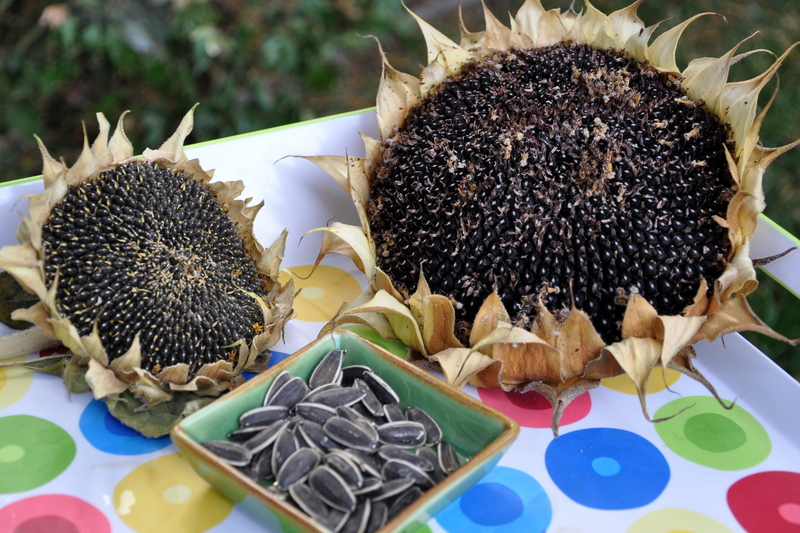 Staying true to their DNA, sunflowers grow from seed to seed in about 90 days. I planted mine in mid-May so I’m on borrowed time. 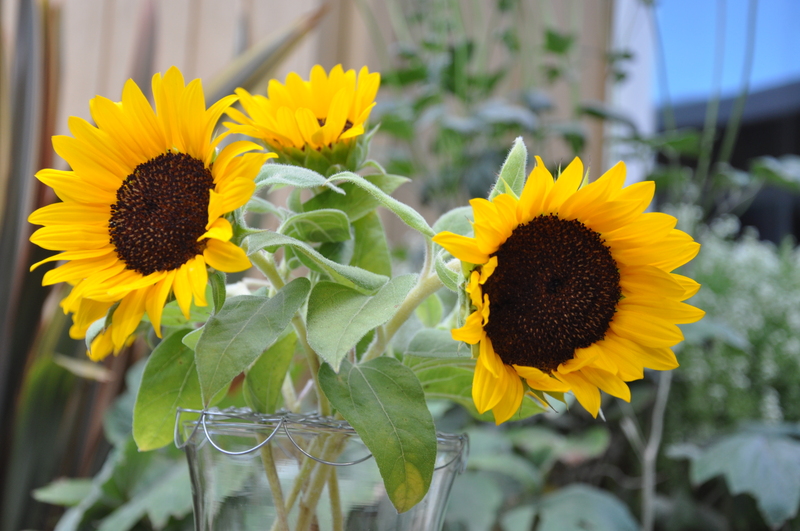 The shortest of the sunflowers bloomed the longest, making them the perfect flower for today’s In a Vase on Monday. 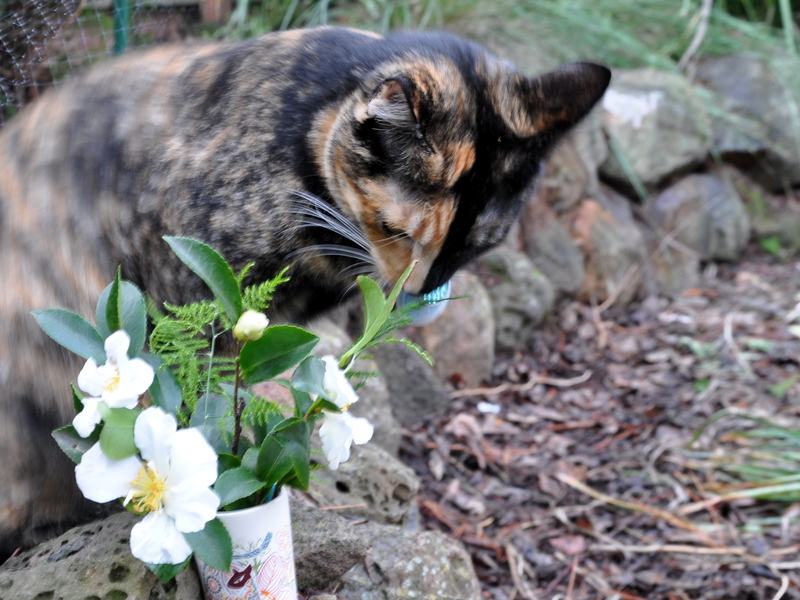 Cathy at Rambling in the Garden features flowers and a prop in a vase each Monday year round. Impressive! She encourages others to participate as well. Come join Words and Herbs and Creating my own Garden in the Hesperides, and others. It’s fun. Check out my new gadget. It’s called an Easy Arranger™. 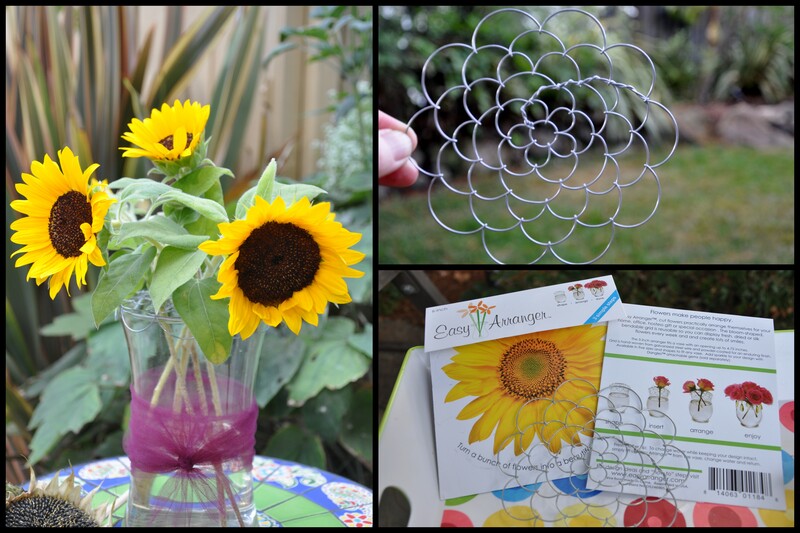 It’s a wire form in the shape of a flower, made in China, assembled in the United States, sold in Canada and now holding up sunflowers harvested in San Jose. My easy arranger should consider applying for a frequent flyer card. I bought two of them in the beautiful gift shop at Butchart Gardens on holiday last month. The malleable form molds over the top of your vase lending support to cut flowers. Pretty nifty, eh? I’ve been gathering seeds from each of the seed heads so I’ll have plenty to plant next year. I’m going to package a few and give them away at Christmas as well. I wish I could share with my readers around the world, but shipping seeds outside of the US is a no-no. As an aside, so is shipping millipedes, but apparently a crate marked ‘toys’ arrived in San Francisco this week with foot-long millipedes illegally shipped from Germany. No thanks! 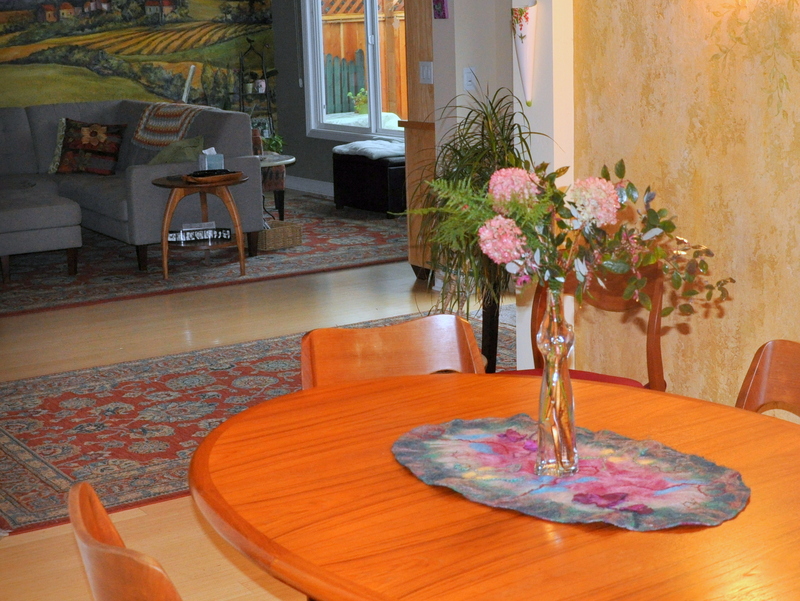 The photo below is the long view, taken from my back door looking out on the space where we read. Although close shots are generally more interesting, I find that I’m often curious about the scenery just out of view. Does this interest you, too? Please leave me a comment, below, or take the quick poll. 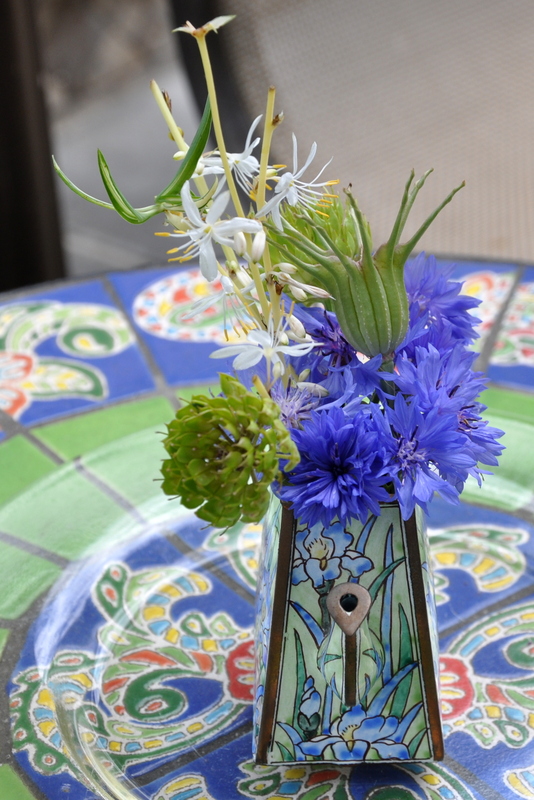 Today’s flower arrangement for In a Vase on Monday came together beautifully…in my head. 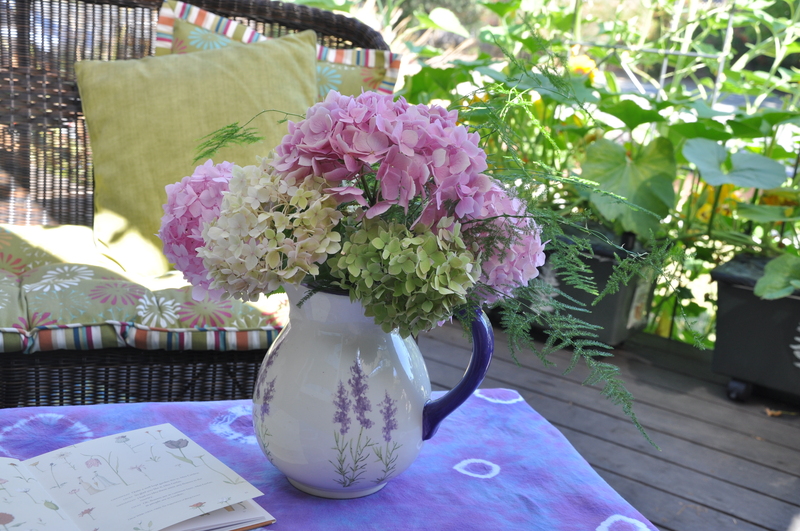 My plan was to arrange Hydrangea in my artsy glass vase. 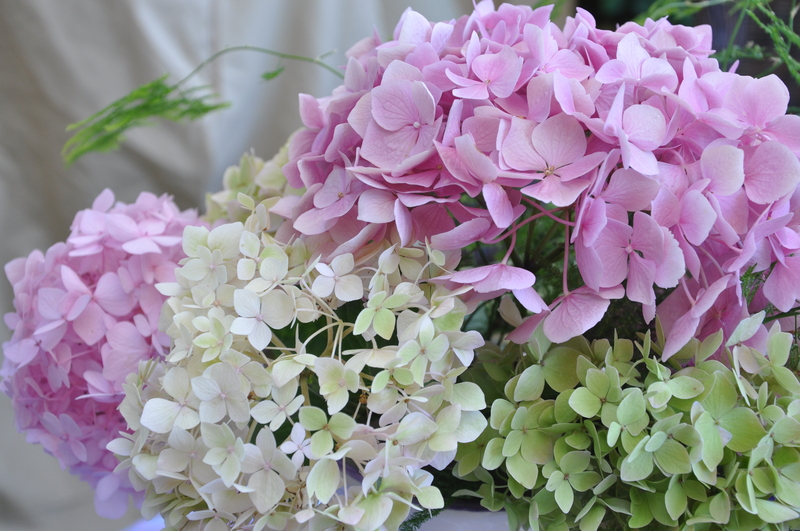 The Hydrangea are fading, turning from pink to pale green to a creamy white. Their blooms are magnificent, even when dried. Yes, I thought, they’d be perfect. I just couldn’t get it to work. The glass vase is long and quite narrow so a bit of a challenge. It’s beautiful though, so I really wanted to use it. After several attempts, I knew my mojo was off. Time to reach for my standby: a pitcher/vase from my friends Doug and Laura. 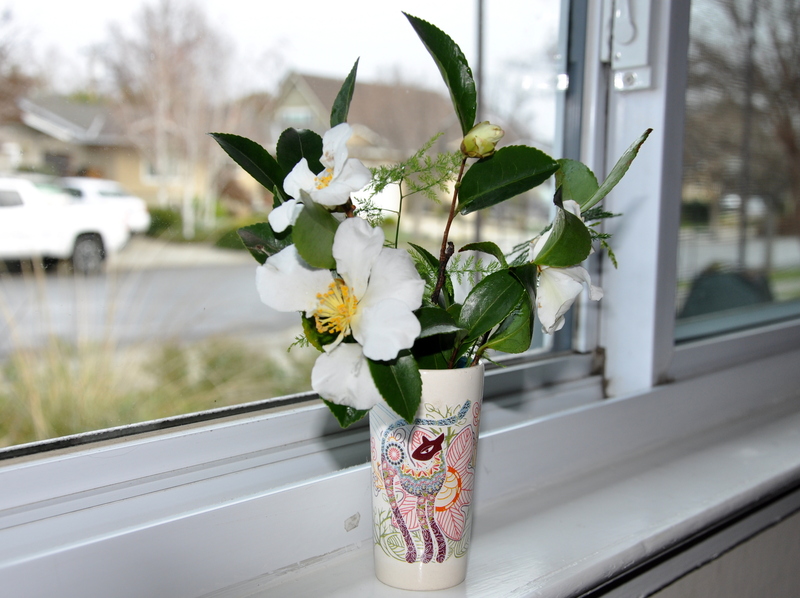 Since the stems were originally cut on the shorter side to accommodate the glass vase I had to improvise. I put a small, square jar on its side in the bottom of the pitcher, then added a second jar on top. Now I had the height needed,and could use less water to fill the jar. A few sprigs of fern added volume and softened the edges. At last it all came together. 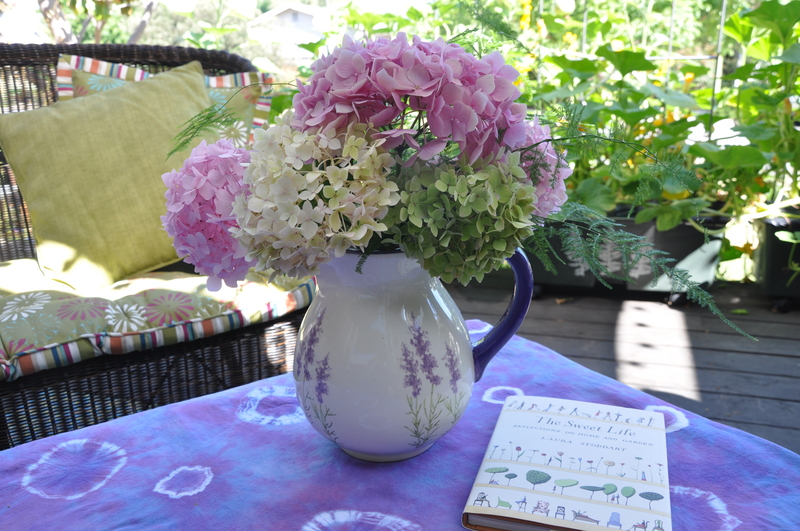 The vase is on the deck, resting on my tie-dyed tablecloth, a project from a couple of summers ago. I added a ‘prop’ as Cathy often does, a special volume of quotes and charming illustrations called The Sweet Life: Reflections on Home and Garden by Laura Stoddart. This charming book makes me smile whenever I open it. Thank you, Nichole. GWENDOLEN Quite a well-kept garden this is, Miss Cardew. CECILY So glad you like it, Miss Fairfax. GWENDOLEN I had no idea there were any flowers in the country. CECILY Oh, flowers are as common here, Miss Fairfax, as people are in London. I constructed costumes for The Importance of Being Earnest many years ago, so lots of Serendipity here. 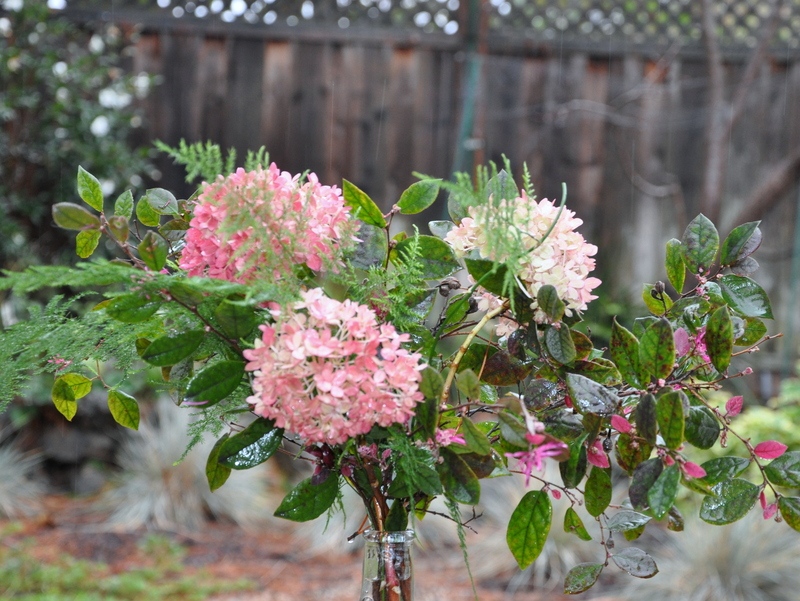 Special thanks to the Cathy at Rambling in the Garden for creating In a Blog on Monday. Thanks as well to Cathy at Words and Herbs for introducing me to the idea. Rambling in the Garden: Fire in the Belly arranged in the West-Midlands, UK. If I missed your vase, please post your link in the comments below. 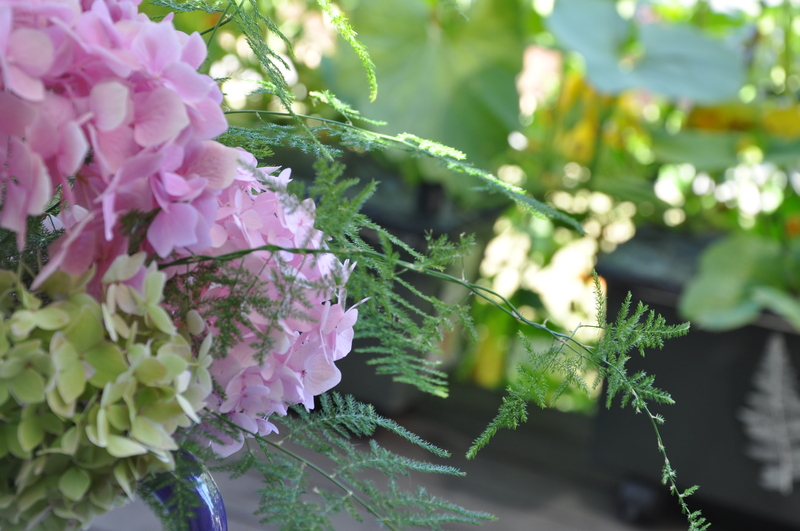 Cathy at Rambling in the Garden arranges flowers in a vase year round. How’s that for inspiration? Several bloggers join in the creative process, posting their own flowers in a vase on Monday, than linking back to her blog. I know I have set myself a difficult task, finding something for a vase every week, and particularly starting in mid-November, but in truth the fact that it IS a challenge will make me more determined to achieve it! Posting a picture of my pickings will also make it easier because I will expect it of myself every Monday – so if anybody would like to join me by placing things ‘In a Vase on Monday’ and posting a picture then please feel free to add a link here so we can all share in the pleasure such vases can bring. Today’s vase has some of everyone’s favourite Persicaria ‘Red Dragon’, Vitis vinifera ‘Purpurea’ and Sedum spectabile ‘Autumn Joy’. Inspired! If you want to join in the fun, simply post your own flower arrangement on a Monday and link back to Rambling in the Garden. 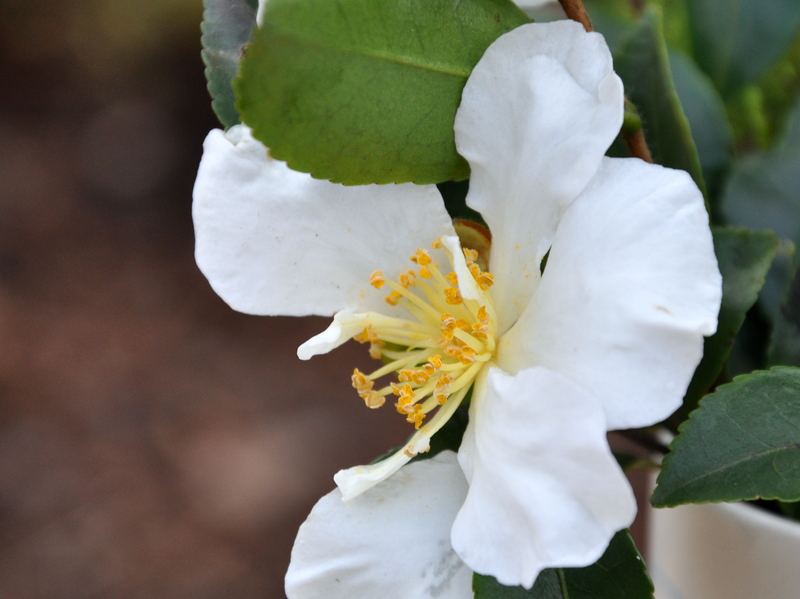 For all my love of miniature gardening, it never occurred to me to arrange flowers in a tiny teapot. I have several. 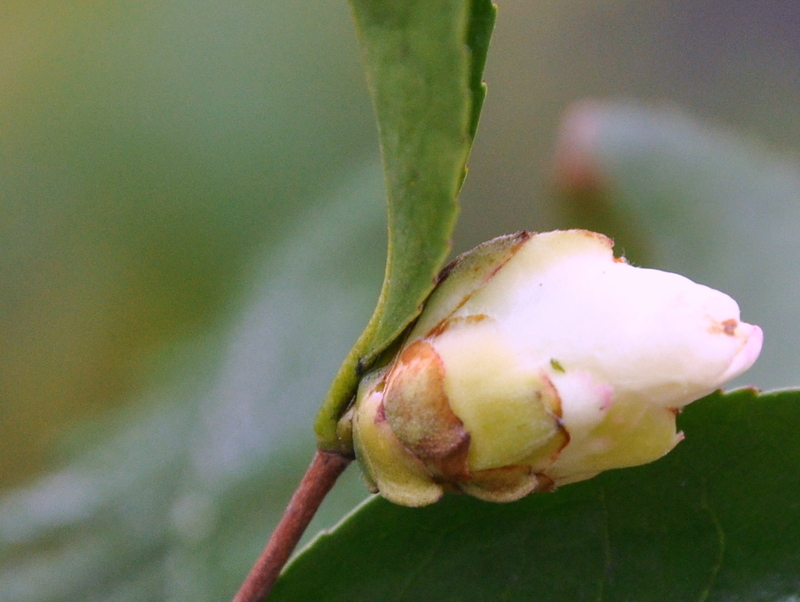 This morning Diane at Garden Sunshine changed all that with her delightful post: tiny pink flowers in a miniature, silver teapot. 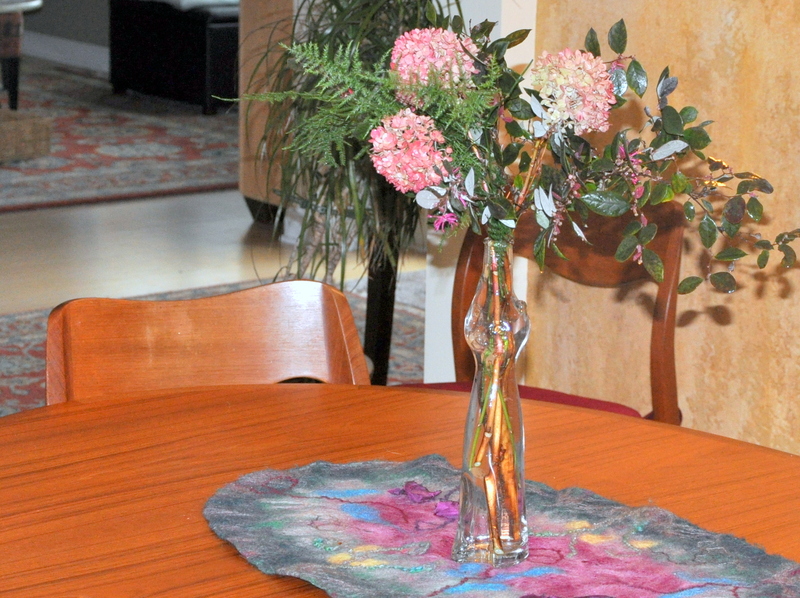 You can see her gorgeous flower arrangement here. 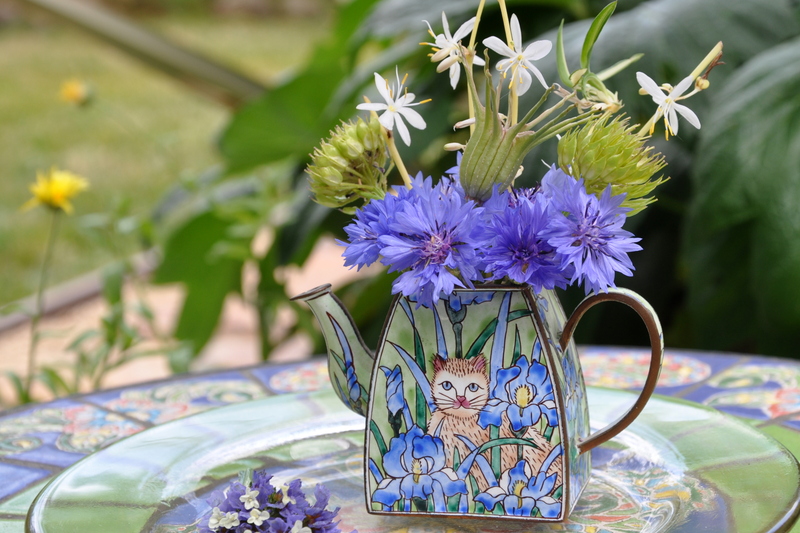 I dusted off one of my cloisonné teapots and put together a tiny arrangement using Bachelor Buttons, Love-in-the Mist seed pods, flowering spider plants and a couple of annuals going to seed. 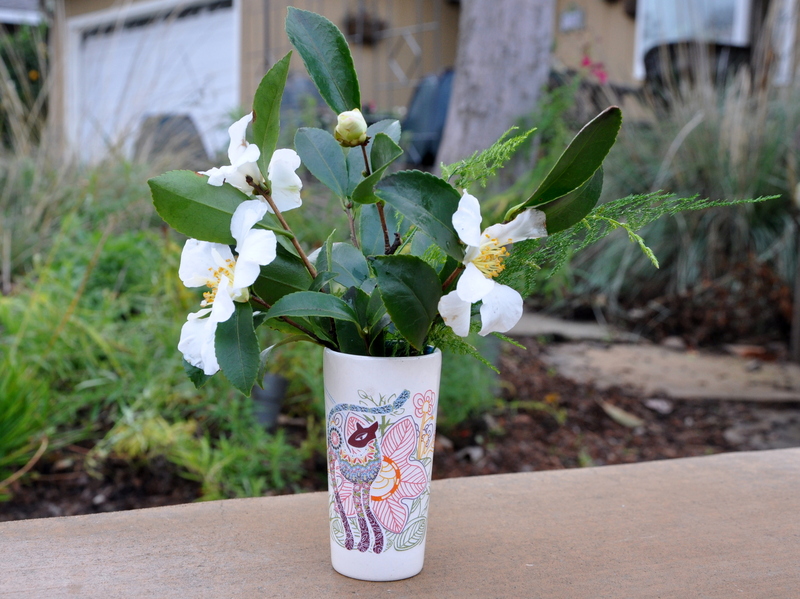 …and a vase is simply a vessel for holding flowers. Artfully arranged Dandelions in a jelly jar qualify for In A Vase on Monday.